The tower in 1999. The house was painted white in the 1920s, and stayed as such for eighty years. The tower in March 2014. Sorry for the poor image. The tower was painted a blue-ish gray. The tower in September 2014. The original colors have been resurrected. All the window sashes are in the basement (in various stages of restoration), and I installed plexiglass (temporarily) in the openings. 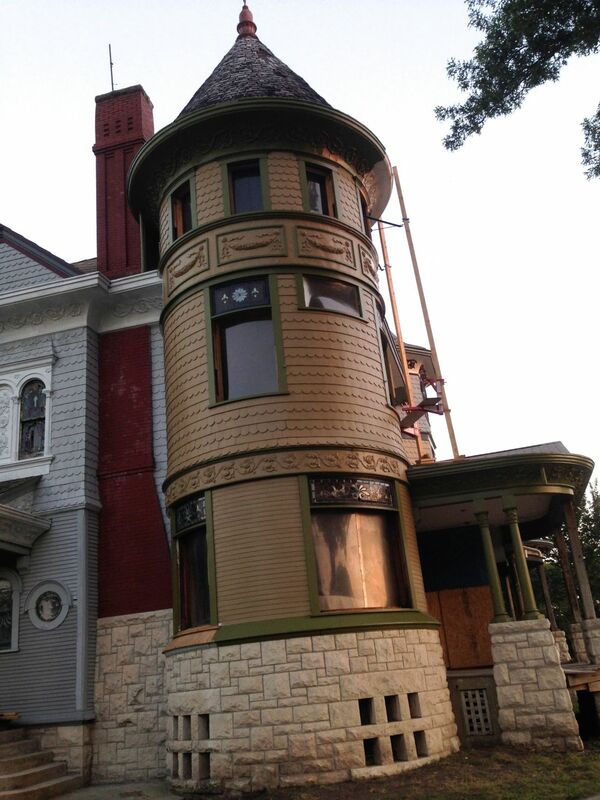 The sashes are being painted black, the original color, and classic! Few people today do black sashes but a century ago black was pretty much the default color. The west facade, November 2014. Workin’ away! Wow! So glad you went with the original colors, it’s turning out beautifully! Kelly! Thanks for the kind words. I am glad you like the colors, too! It is a thrill seeing the original colors return after a century hiatus! 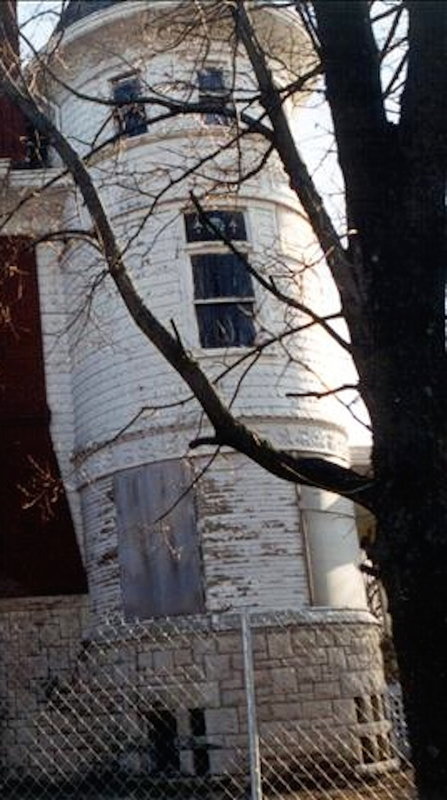 NOTE TO OTHER READERS: Kelly has INCREDIBLE blog, and all about old houses. When I open these photos, my heart races. I am so thrilled this is happening, and am enjoying every post ! Betsy, you made me laugh! Obviously, you are a kindred spirit! Your scaffolding is a work of art. As are your paint colors and house of course! I’m so pleased you started writing about your Cross House, makes me feel a tad less insane (although so jealous that it survived apartmenthood without being gutted). Hi Meg! Do you have any kind of URL link to your house? And may I say: WOW! You have also just ruined my morning! I just spent an hour (which I do not have) pouring over your blog. Wow! WOW! Wow, that looks incredible! The colors really do bring things out in the right way. 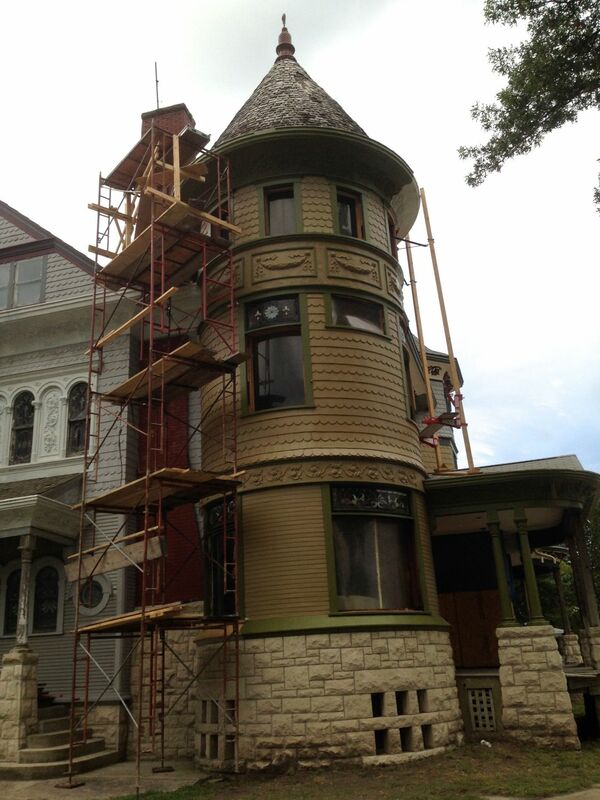 There’s a Victorian in our neighborhood painted similar colors, but with a brick foundation. The limestone foundation on yours really looks great. I love the dark window sashes too. I used a very dark gray when I restored ours. It really highlights the depth of historic wood windows. How many gallons of paint to do the whole house? Love the colors!! I do not know how many gallons it will take. So far, I have used about 3 gallons of the trim color, and 8 of the wall color. Beautiful! How were you able to determine the original paint colors? Scraping and color matching? I am so enjoying your blog which, like others, I discovered while reading OHD. I feel like Alice, tumbling down the rabbit hole, as I’m discovering a new and wonderous world of old home restoration. A place where fears and anxiety can be expressed as well as happiness and comradery. 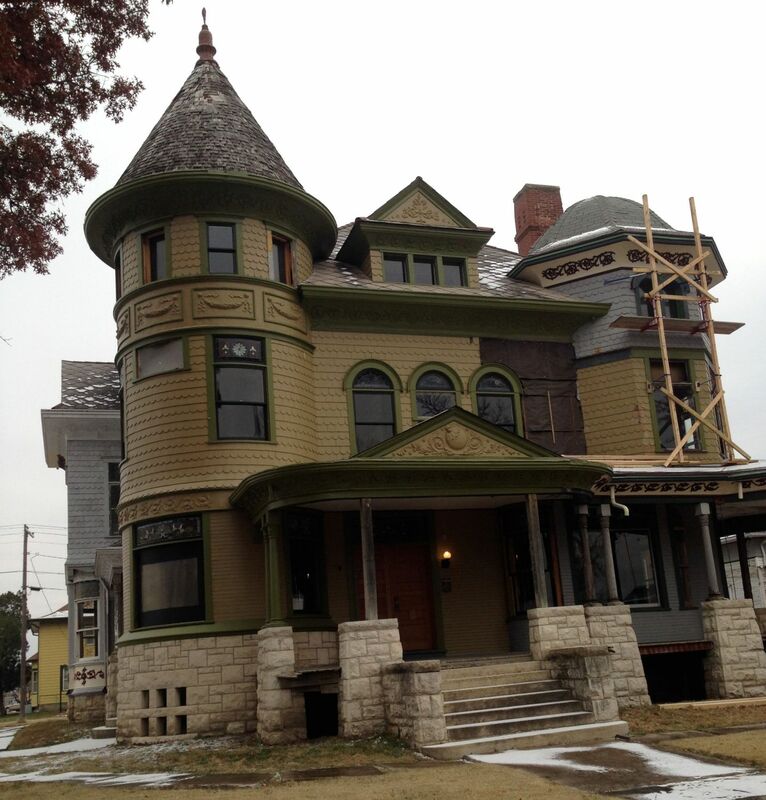 Have you mentioned here anywhere how much it cost to build the house in 1894?